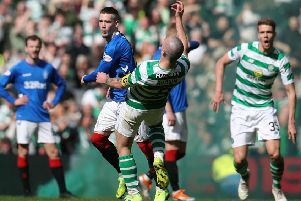 There is real anger both within and outside the Ibrox club over certain aspects of the Celtic Park clash – in particular the conduct of Scott Brown – but Gerrard is fully aware that focus must now centre on the immediate job in hand and the seven remaining Scottish Premiership fixtures. “For myself and my players, it’s important that we rest and refocus on what is in front of us,” said Gerrard. “In football - whether you are on the back of a high or a low – it’s important you move on very quickly. “After defeat against a rival, it’s nice to have a game pretty quickly to refocus and we have the chance to, hopefully, get a good performance and win against Hearts to get the feelgood factor back. Gerrard was in no doubt about his targets for the remaining weeks of the season. “We want to win as many football matches as we can,” he said. 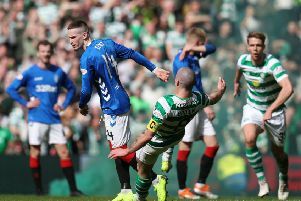 “We have seven good games left – two obviously before the split - and we need to try to react and use our frustration and disappointment from the ‘Old Firm’ clash and use that in the next couple of games. “Then we get a bit of a break before having five very exciting games in the split where we need to try and take as many points as we can, before we analyse the season as a whole. “We’ve played them (Hearts) a couple of times, and they’ve been both aggressive and positive. “They are a big, physical and aggressive team, and I mean that in and out of possession.